Have you ever felt that taking care of yourself comes last? 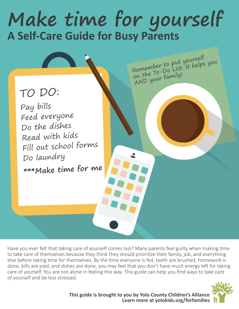 Many parents feel guilty when making time to take care of themselves because they think they should prioritize their family, job, and everything else before taking time for themselves. By the time everyone is fed, teeth are brushed, homework is done, bills are paid, and dishes are done, you may feel that you don’t have much energy left for taking care of yourself. You are not alone in feeling this way. This guide can help you find ways to take care of yourself and be less stressed. Improve your relationship with your child. When you are calm, you can connect more deeply with your child. When your kids watch you take care of yourself, you are also teaching them how to handle stress better and be healthier! Because we know you’re busy, the self-care ideas in this guide are separated into those that only take about 5 minutes to do and those that you can do when you have more time. There are also activities you can do with your child. The ideas involve calming your mind, connecting with supportive relatives and friends, exercising, laughing, finding activities that bring you joy, and getting enough sleep. The ideas do not cost money or require special equipment. There are also some resources that can help you during times of stress.